The cello part from Verdi's Requiem has been edited by Ronald Leonard, principal cellist of the Los Angeles Philharmonic from 1975 until 1999. Leonard's bowings, fingerings and other editorial markings have been added throughout the score. Verdi's Requiem is the musical setting of the Roman Catholic funeral mass for four soloists, double choir, and orchestra. Composed in memory of the Italian poet and novelist Alessandro Manzoni, whom Verdi admired, the Requiem was first performed on the anniversary of Manzoni's death on May 22, 1874. Today it is much more commonly performed in concert settings rather than for liturgical purposes. A typical performance lasts around 85–90 minutes in length, and it arguably the most frequently performed major choral work aside from Mozart's Requiem. In the Requiem, Verdi employs vigorous rhythms, sublime melodies, and dramatic contrasts – much like in his operas – to express the deep emotions in the text. After the introduction and Kyrie, the terrifying and instantly recognizable Dies irae Latin hymn emerges. Verdi also used powerful symphonic instrumentation to enhance the effect of the vocals, such as in the Sanctus, a complex eight-part fugue scored for double chorus that enters with a brass fanfare. 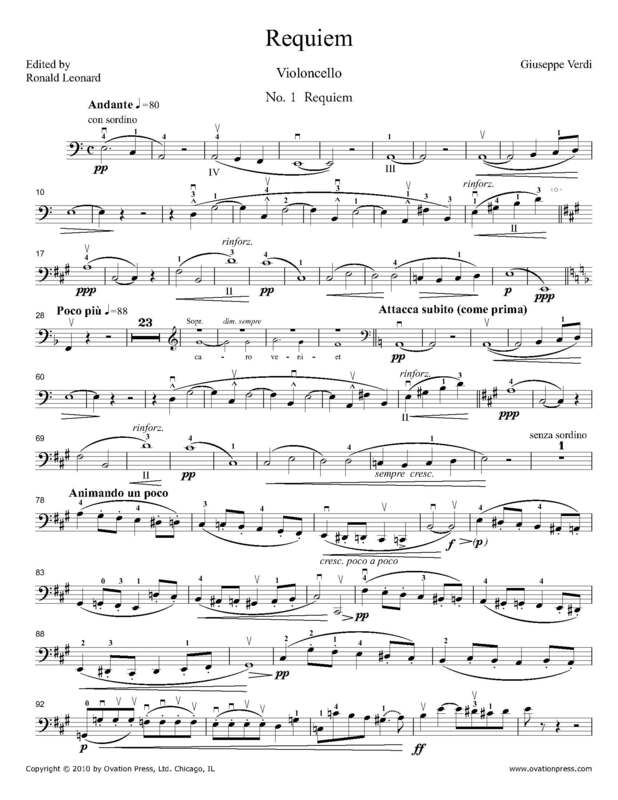 Download and print the score today to gain access to expertly edited Verdi Requiem cello fingerings and bowings from Ronald Leonard!